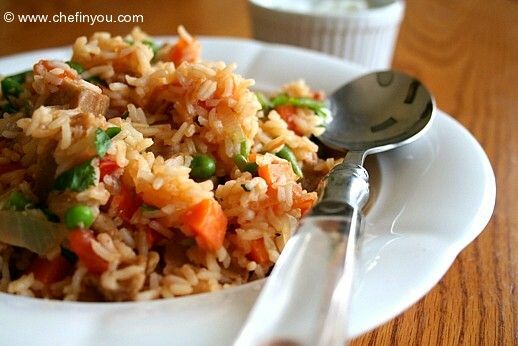 I am always on the lookout for rice recipes - and if it is simple enough, it makes my life much easier. Also it helps for packing lunch box. Talking about which - I have to say that while it is indeed a god saver to have a husband who has some international taste in food ( having eaten in countless restaurants for many years) since you get some free tips on different recipes all over the world - it also comes with unwanted package. You know you are always going to be judged with some restaurant standard tastes. So when I try to create some 'had-this-dish-in-so-and-so-restaurant' recipe (of course without knowing how it should taste in the first place, I most often end up with 'uhh-nice-but-well-that-one-was-different'. Ask 'what's different?' and pat comes the most unhelpful answer 'mm-dunno-something-missing'! Great! Now I know!!!!!!!!!!! Few recipes work bang on - like Focaccia, Kimchi, Bee Bim Bap and Ratatouille which worked bang on with him the very first time I made it (and which I had never tasted before then). On those cases when I actually have them later in the restaurants, it amazes me sometimes how close many of my such tries come so close :) In this list is this Jollof rice. He has had the vegetarian version of this dish. 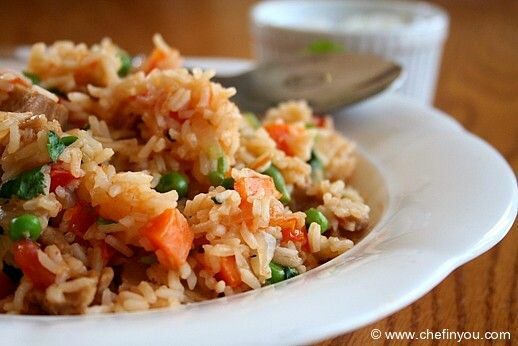 It is similar to Indian Tomato rice only with some protein (meat, fish etc) added to it. I used Seitan to replace the meat (which is entirely optional). One can use only vegetables alone. The variety of vegetables depends on you. African Jollof is also called as ''Benachin'' which means 'One Pot' in the Wolof Language. It is a popular dish especially in Nigeria and Ghana and enjoys quite a handful of variations. The basic components seem to be the same which has ingredients like Tomatoes, tomato paste, rice and onions. The kind of meat or vegetables is entirely up to you along with spices. Here is my version with more vegetables and vegetarian protein - seitan. 2. Add the chopped carrots next and saute for a minute with little salt. 3. Add the tomato paste, tomatoes along with curry powder. Cook until tomatoes get slightly soft. Add the rice next. Saute for another 2 minutes or so. 5. Add the frozen peas and beans along with Seitan. Since I used to precooked variety, it just needed warming up and not cooking per se. Hence added them last along with frozen vegetables. If using fresh add it along with rice. 6. Stir it until well combined, add nutmeg and cook for another 5-6 minutes or so for the flavors to get together. 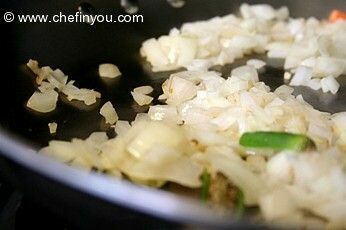 Add lots of garnish and serve hot. I served with some vegetable chips and some raita. Any raita will go well with this dish. Hi I am from Jamaica and my husband is from Ghana. Here in Jamaica we make a similar dish called "Seasoned Rice". Its a basic and fantastic one pot meal which you use rice, mixed vegetables, pumpkin, ackee( our national fruit) and cooked fish or any other meat you desire. Pls what are cumin seeds and seitan? This is an amazing dish, for everyone saying they are Ghanaian and this and that and that this isn't the true way of making Benachin or Jollof Rice, Ghana is not the only country to make this majority of west Africans make this and it's not done one way ppl have their one way of making it so instead of complaining this isn't the correct way show us how'd you do it... It's more logical to do that than bash on someone's delicious recipe!!! Im a Ghanaian and i love Jollof rice very well. I want to add ma experience to urs. :-P Jollof rice taste great wen u have more blended onions added to it.Try it ! This could be called anything, but not Jollof. It just isn't dark enough. 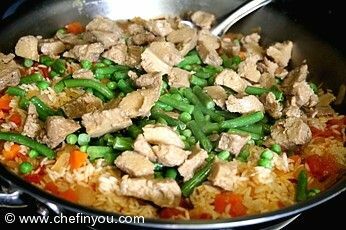 Moreover the garlic and ginger would do more harm than good to Jollof rice... Nice recipe, but please find another name for it. i am polish and this is not the true way of Ghanaian Jolof rice, use veg oil or butter to fry as it gives an extra kick of nuts. 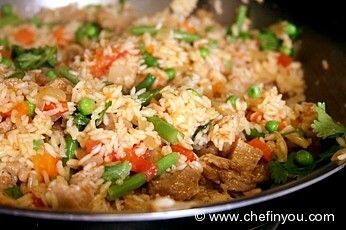 ALWAYS USE LONG GRAIN RICE and cook for at least 2 hrs to cook on a high heat. 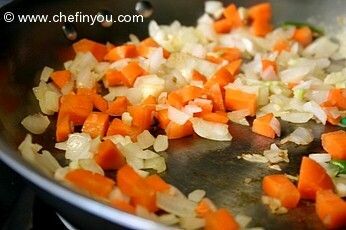 when chopping the vegetables chop into large triangles so it looks presentable chunks, mu name is jasmine and I have been cooking the fienst since I was 14, 38 yers ago. I'm Nigerian, and jollof as I know is prepared differently. Adding garlic to jollof rice and ginger kills the original taste of jollof. Your method seems interesting but not for jollof rice. 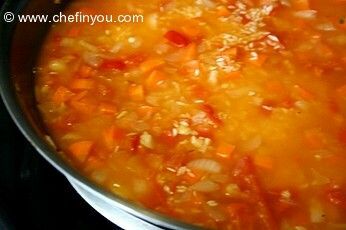 All u just have to do is fry ur onions and tomatoes well blended with pepper all together, add thyme and maggi cubes, salt and then add ur stock water for whatever protein u're using, allow it to boil out the pour in ur rice and stir for total mixture. Cook on low heat. When the water is dried out sprinkle a little curry leaves on it and stir.and that's ur jollof rice. You cld eat it with fried fish, fried meat or fried chicken. Never use palm oil for jollof rice, that's a different dish entirely. This recipe calls for treenut oil. I'm not sure what that is. Can I use vegetable oil or olive oil? Also, I was unable to find cumin seeds. Any ideas for how I could make this with cumin powder? Thank you! Thank you so much for this recipe , just prepared Jollof following your recipe and the guys truly loved it . :-P you can also make it with corned beef its extra yummi!! Good heavens, NOT palm oil! Please, whatever you do, DON'T make jollof with palm oil!!! i am a ghanaian and i dont really know a lot of the foodstaffs.probably because we are used to the local names.is there a site that has this kinda info? telling the public the english names for some or all of the ghanaian vegetables..
Great recipe. I see some comments saying that this is not how it's made, but there are several variations of the dish and they dont have to be exactly the same. I'm 100% ghanaian and a self-proclaimed jollof aficionado ( :wink: ) and I also have several different methods for making it. Great job.You seem to have grasped the concept of the dish very well. BTW what is Seitan? :wink: may I I have the recipe too? My father was Ghanaian and I have been trying to make jalof rice like him since he passed. Today is his birthday and I am making it for my new in laws and siblings. you have a nice recipe but this is not how we make our jollof. this is totally different. you don't seem to have enough tomato sauce. veggies are up to you but I would put less to get the taste of the rice. I'm a pure Ghanaian so if you would like the recipe I'd be glad to give it to you. i dont know where you got your recpe from but this is not jollof rice at all. 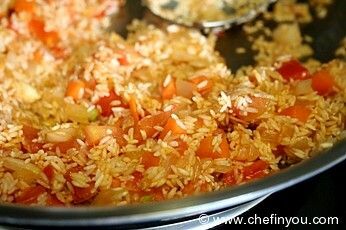 Jollof rice is a rich tomato stew, and the rice is added after the tomato stew has cooked thoroughly and then you steam it. Most of the spices you mentioned are not used in west african cooking. Nutmeg is not used in most tomatoe based sauces in Africa. 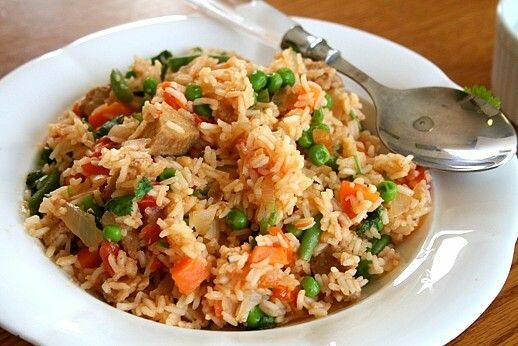 Your version of jollof rice looks good but it looks more like a fried rice with a little bit of tomatoes added. I am sure it is good. But real jollof rice has a more deep orange/redish color to it. most people will eat it with a salad on the side. The vegetables mixed with yours is not usual with how it is prepared. Absoloutly loved your recipe for "African Jollof Rice". It went perfectly with my baked Cajon chicken recipe. Hot and flavoursome, a winner with all of my family. Thankyou. I'm a 16 year old Ghanaian girl and when I prepare my jollof for my household, I ALWAYS use nutmeg and maggi cubes. It makes the taste much much better. and sometimes I use a little ginger and that brings out the flavor. I recently ate with a Nigerian Family. The hostess served Jollof rice w chicken and yes we had dodo. Loved the rice and the dodo. Plan on making the rice tonight. She used red peppers that she pureed and made a sauce with. So Yummy. im nigerian and have eaten jollof rice many times and thats not really how u make it number one most nigerians dont even eat garlic and wat is seitan also i have never heard of any body ever putting ginger or nutmeg in it either but as u you said i varies through different cultures but wat my family usaully does is we just put tomatoe sauce maggi,curry ,rosemerry,thyme,onion powder,and salt and just wait till the tomoto sauce condenses and the rice is cooked . Thanks for your input. It always helps to have people from the original place to give recipes cos otherwise the authenticity does get diluted in other regions. All the versions I saw did have these ingredients along with meat. Seitan is my inclusion to replace the Meat with Vegetarian Protein. Seitan is wheat protein. I do agree with the first post that curry powder doesn't go with jollof rice. It sort of changes the original taste. There are stock cubes by Maggi that we used and apart from that, there are the local chillis (African variety, super hot) that goes into the puree and the puree is sauteed in oil before adding the rice. Anyhow, what tastes good is worth the cooking and this recipe is yet another most welcome proof of the pudding! Keep it up. I first want to say this. Jollof Rice comes from the Wolof People of Senegal,West Africa and the spices used to not go into traditional Jollof Rice. I know because my wife is Senegalese and I have learned a lot about West African cuisine through her and her family. ;-) Curry Powder, nutmeg, ginger and cumin DO NOT I repeat DO NOT go into Jollof rice. Those spices gave it a more East Indian feel. However this dish was still awesome none-the-less. When I made it I knew by the ingredients it wasn't traditional. However it sure was good. I will make this again and again! It's simple and quite tasty. My wife said it may not be the same but even she, with her hard to please self found this very delicious! In fact, we are going to make some this weekend. I love one-dish meals. This is perfect as it has carbs, lots of veggies and also protein. I am a Filipino who loves to experiment in the kitchen. 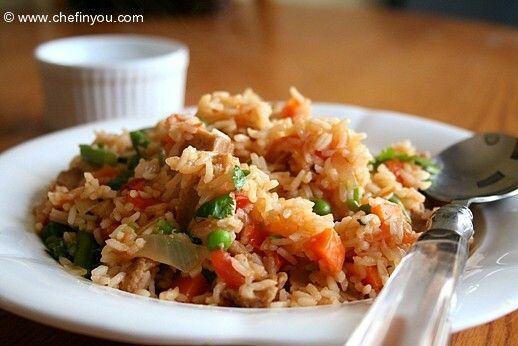 I prepare a similar rice recipe I call 'fried rice' whereby I use everything that has been classified as 'leftovers'. I use a lot od garlic, turmeric powder, curry leaves (from my own plants), frozen mixed veggies and any meat 'leftovers'. The result is a fusion of filipino/chinese/indian cuisine. LOL. You might not believe me when I say I have eaten this a lot, but I have. My mom's colleagues used to make veg. version for us. This is usually served with "dodo" which is pan-fried/ deep-fried sweet plantain slices. Nice pictures! They look so delicious! I love that you put seitan in this! Right looks bright and vibrant with those veggies! Pretty picture. Looks really delicious! Looks delicious DK. Jazzed up tomato rice. Its so interesting to learn that there are so many similarities between different food cultures. Delicious rice, very new to me...Eye pleasing colour DK..